This entry was posted on July 26, 2014, 2:17 am and is filed under SLPP, Social Learning, Social Media, Twitter. You can follow any responses to this entry through RSS 2.0. You can leave a response, or trackback from your own site. Great points – def agree that 1st few twitter chats are a bit like “what just happened there?! !” – and really just as you’ve said, mostly observing and participating where you can. I remember first hearing about lrnchat years ago and having absolutely NO idea what was going on when I attempted to check it out. It kind of scared me off twitter – and I didn’t ‘get’ twitter or tweet chats really, until I participated in a few as part of a Mooc. I think your point about participation as a means to connecting with others is an important one – I only started to ‘get’ twitter and see the benefit of it once I started to actively participate in things and interact with people – via chats, tweeting links to blogs, moocs, etc – and I think the thing about twitter in particular that makes it a little different from other platforms is that it’s kind of casual, fun & easy – it’s a great conduit to spark connections which can lead to more substantial interactions or collaborations. There aren’t many mediums other than twitter where you’d be able to actually interact with people in your industry, authors, practitioners etc whose work you admire – if it’s gonna happen anywhere, it’s probably gonna happen on twitter! 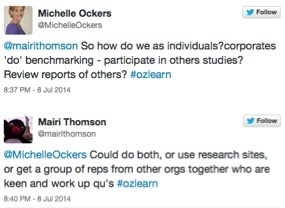 Oh – also I meant to say thanks for the comment about the storify of that OzLearn chat. Storifying is quite a fascinating process – tweet chats are such manic things – it’s not a linear experience but narratives are – so in order to form a narrative of a tweet chat that makes sense, it helps to align the threads (sometimes it’s not always easy to find the threads!). But glad you found it helpful!